What is retargeting? Retargeting or Remarketing is the tactic of serving ads to users who have previously visited your website, or product page. This is especially useful for giving users the illusion that your business is much larger than it really is! Your ads will continue to be served to users who have previously visited your site, as they continue to navigate throughout the internet. Help keep your business top of mind to those who have already been to your site! Display retargeting ads are visual ads run through the display network, however they are specifically served to people who have already visited your site. Remarketing is a must-have addition to any traffic-driving strategy. It’s not always the first ad that drives the conversion, it’s often repeated exposure that does the trick! 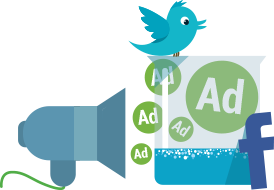 TechWyse also offers social retargeting on Facebook and Twitter! Your business doesn't need to have a social presence, but there’s a good chance your customers do. You can retarget your website visitors after they leave their site while they’re browsing social networks! Social Retargeting is quickly becoming a favorite in the industry due to it’s low average cost-per-acquisition (CPA). Your website will have a cookie which sticks to the online footprint of anybody who visits, allowing you to advertise your products and services on the other websites they view. You can even increase the number of times they see your ads during the peak times they’re most likely to convert! Will I annoy people with my retargeting ads? Retargeting ads are shown to people more on the day after visiting your site, as that’s when they’re most likely to convert. Once they have converted, they stop seeing the ads! We take measures to ensure it doesn’t become advertising-overload. Where can I retarget my ads? We market in the Google display network, but we also retarget our clients’ ads on places like Facebook and Twitter as well. Our goal is to get as many eyes on your website as possible, so your ads will be retargeted where our experts see best fit. Do I have to pay every site my ad shows up on? 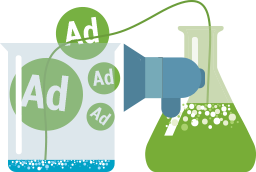 There are two ways to do retargeting campaigns: Through CPC (cost per click), or CPM (cost per thousand impressions). CPM charges you for every thousand impressions your ad display, whereas with CPC you’ll only get charged when someone clicks on your ad. We retarget using CPC, which saves you money by ensuring you’re only paying for people interested in your services!